Follow the full Bible story as it happened, when it happened. Read the whole Bible arranged in time order so you can see how everything fits together into God’s unfolding plan from beginning to end. The new four-colour Chronological Life Application Study Bible combines the proven resources of the Life Application Study Bible with a chronological format and several brand-new resources. The Bible is arranged in 10 chronological sections that help the reader to see how the various pieces of the Bible fit together. New section intros and timelines set the stage for the passages in each section. New archaeological notes and photographs help to bring God's story to life in a whole new way. And of course, the Life Application resources answer the all-important question - so what? 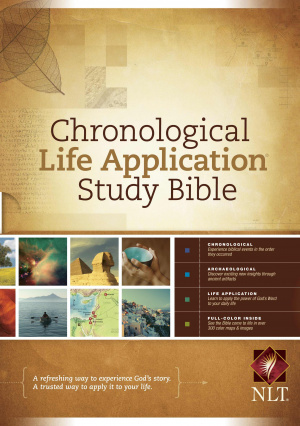 NLT Chronological Life Application Study Bible (Hardcover) by Tyndale was published by Tyndale House Publishers in October 2012 and is our 9039th best seller. The ISBN for NLT Chronological Life Application Study Bible (Hardcover) is 9781414339276. Be the first to review NLT Chronological Life Application Study Bible (Hardcover)! Take a peek at some articles related to NLT Chronological Life Application Study Bible (Hardcover). Got a question? No problem! Just click here to ask us about NLT Chronological Life Application Study Bible (Hardcover). A:No, though this Chronological Bible features hundreds of full-colour illustrations and maps, the words of Jesus are not printed in red. A:The main Bible text features a 9 point font size, with the study notes slightly smaller at around 7 point. "I have to say, this version of the Bible is fresh and exciting. I have never had a chronological Bible before so this is new to me. I love how this Bible is divided into time eras and within the eras all of the books are in timeline order. This really helps with the OT as well as how the Epistles are intertwined with Acts. The full color photos make it like the NIV Archaeological Study Bible. Full color charts add flavor to the notes. The best part is the Life Application notes as well as Bible character focuses. Wrap that all up in the NLT translation that is easy to read yet maintains integrity to the original Bible text and you have something that is great for today, tomorrow, and years to come." "I've been looking for a study bible with color and good information. This IS it! It has beautiful color illustrations, photos, maps, charts etc. to make the bible come alive! It has the Life Application study notes, archaeological information, and running timeline all in a chronological format. It is written in the easy to understand NLT format. CBD is definitely the place to buy this treasured resource for the best price and service."